February | 2012 | Growing up……….. There was an interesting article in the Washington Post today. I won’t explain all of the details of the article. It’s a pretty decent read so please check it out yourselves. It basically says exactly what the title suggests – that black women, although heavier, are happier with their bodies than white women. Both women have societal pressures but they’re different. Some white women have this skinny or bust motive while black women will get chastised if they become skin and bones. Although I’m a dude, I’m sure one of the hardest battles a woman has to endure is acceptance of her body. There’s just so much external pressure. Dudes. Another women. Family. Magazines. TV. Videos. Social Media. You name it. But I think the bigger issue is what’s going on in the inside; not how they look on the outside. The bottom line is are you healthy? What’s your blood pressure? Are you on medication? What’s your cholesterol? Does your family have a history of medical issues? When’s the last time you went to the doctor? What are your glucose levels? People automatically make assumptions that skinny is healthy. In some cases, it’s not. People also seemed to get confused between phat and fat. While I’m all for appreciating your curves, I don’t want you getting tired walking down the block or up a flight of steps or you telling me to stop after my first ten pumps when we doing the grown-up (wait…let me think about that). Seriously though. Love your body. Stand in the mirror and look at yourself. No spanx. No clothes. Nothing. Learn to appreciate what you have and do what you have to do to be healthy. 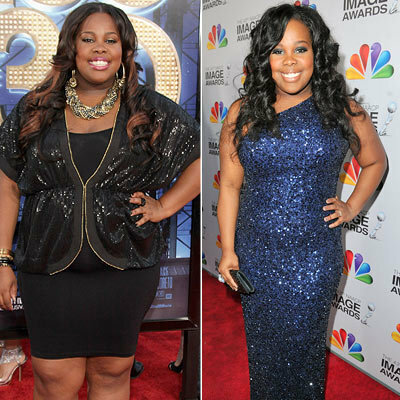 I read an article today that showed Amber Riley (pictured below) dropped 2 dress sizes! Good for her right? So why were people hating in the comments section? It’s the same thing that happened to Jennifer Hudson, Raven Symone, Jill Scott. The minute they start losing weight and adopting a healthier lifestyle, people don’t like it. They want the old “thicker” person back. Maybe it’s because those people who want people to stay “thicker” are “thick” themselves and want to have someone to identify with. Maybe? Or maybe those people are too lazy to make a change like other people are…………..